"What interested me about pop was it was directly engaging with the imagery ... I saw it as critical." Regardless of medium or message, Martha Rosler's biggest contribution to the art world lies in her ability to present imagery that spotlights the veil between facade and reality, comfort and discomfort, and the myriad ways we keep our eyes wide shut or wide open. During the Feminist art movement of the 1970s, she explored the imposed versus exposed injustices of being a woman. As a member of the Pop art movement, she highlighted the media's targeted seduction of people into a more consumerist-driven lifestyle. Today, she continues to focus on our still inbred aptitude for replacing dire global realities such as war with fluffy faux-reality distractions like reality television and advertisement-driven personal entertainments. Her knack remains in showing us the shadow side of society alongside the constructions we build to appease our souls for partaking in its enveloping fold. Neither is diffused in her making, as she honestly presents the existence of each. Her work often focuses on political issues such as war or injustice but in a way that challenges us to bring these topics into a more personal sphere, not just relegated to the pages of a magazine or a prime time news report. She asks us to pay attention to what is happening even if it is not occurring within our own environments and to consider the role that the media has in controlling how we perceive world events. Pop art provided Rosler with a good vehicle to address themes she wanted to explore because of its use of photomontage and collaged imagery. It also allowed her to co-opt the very visuals she wished to critique, presenting them in her own pieces. 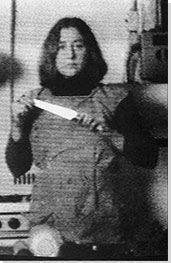 Rosler became a leading figure in the Feminist art movement because much of her work revealed the divide between how women were portrayed as individuals whose only place was within the confines of home, marriage, kitchen, and motherhood and the way they actually felt by being pigeonholed into said domestic roles. She also used brave new technologies such as video to differentiate herself from the male art stars and their traditional mediums that had come before. Rosler is also known for her prolific writing and theory on the role of photography in art, as well as her interest in public spaces. Her 1981 essay on documentary photography discusses how people derive meaning from photographs and has been republished in multitude and widely translated. In this photomontage, Rosler uses pieces cut from magazine advertisements. A black-and-white image of a woman, with haircut and dress typical of the late-1960s, cleans heavily brocaded gold drapes with a cream paisley design. A vacuum is slung over her left shoulder as her hand pulls out the drape to make it taut. Her right hand drags the long hose attachment vertically down the fabric as she works. The far right depicts the other side of the drapes, framing a window in which we see a black-and-white scene of war. Large boulders fill the space in the center where two fully outfitted soldiers stand wearing helmets. Caught in a moment of rest, one smokes a cigarette while the other looks out at something in the distance. Their machine guns rest behind them and a gray ominous sky weighs oppressively above. This work is one of twenty pieces from Rosler's House Beautiful: Bringing the War Home (c.1967-72) series created during, and influenced by, the Vietnam War. It was the first war in history that was literally brought into the homes of American people through the revolutionary new television set from which its horrors could be witnessed daily. It was often described as a "living room war" - a description loaded with strange poignancy as it shined a light on the eeriness of a nation living their everyday lives, ripe with consumerist concerns like keeping the stylish home drapes clean, all the while gruesome political realities took place elsewhere, becoming just another form of nightly entertainment in front of the tube. This work is an important example of Rosler's role in multiple art historical movements. Her presence in the Pop art scene is clear here through the repurposing and reinterpretation of images from popular culture, news, home decorating, and housekeeping magazines. She also showcases her aggressive Activist vein. Because the typical American family's view of the war was shaped by media images, Rosler's compositions ask the viewer to consider the power that the media has in shaping one's view of politics. Rosler often purposely published these images in anti-war magazines and distributed copies of the work to like-minded individuals. Simultaneously, there is a feminist element to the work as it comments on the robotic mundaneness of female domestic work in the midst of global unrest. The idea of women striving to keep the house beautiful while war's tragedies are omnipresent becomes almost comical, and presents a surreal picture about what we deem important. Recognizing the potential for manipulation in the photographic medium, Rosler once stated, "Any familiarity with photographic history shows that manipulation is integral to photography." Woman With Vacuum, or Vacuuming Pop Art is another work of photomontage. Fragments of images from magazines and advertisements depict a long narrow corridor with cream-colored walls on which hang colorful Pop art works and exhibition posters. Overhead is a red ceiling from which hang white globe lights. In the center of the work, a woman stands vacuuming a dark brown-carpeted floor. She is young and on trend with short hair, a white short-sleeve blouse, a calf-length dark green skirt, and black pumps. She holds the hose to the vacuum (positioned opposite and slightly behind her) in her left hand as she vacuums with her right. She confronts the viewer with a big smile on her red lips. This work, while part of the larger Body Beautiful, or Beauty Knows No Pain series (c. 1967-72), differs from many of Rosler's other works. Although it does indeed weave her common theme of addressing how women were recognized solely as housekeeping beauties in media at the time, it also takes it a step further by questioning women's underrepresented role as viable artists in the art world. Surrounded by works of Pop art, the woman smiles, happy to care for the space in which the art is hung. This figure is seemingly content in her domesticity and would never think to move beyond this task, accepting of her gender's fate of non-inclusion within the sphere of art, she exists merely to clean. In a visually ironic way, Rosler uses the already ironically playful nature of Pop art to make this searing indictment on the way that women were treated in the art world of the 1960s and early 1970s. Despite the fact that there were many important female contributors to the genre such as Rosler, they were largely unrecognized. Male artists like Andy Warhol, Roy Lichtenstein, and Tom Wesselmann (whose work is recreated on the corridor wall) were the ones most associated with the movement and whose work was most frequently exhibited. Furthering her use of appropriated imagery in Cold Meat I, Rosler presents a picture of a refrigerator formed from the naked torso of a female. The top door is open to reveal a freezer stocked with food. In front of the refrigerator are four long strips, of what appear to be flesh, lying flat on a blue background. The piece is one of a series of works in which the perfect naked female form, often exploited and objectified in popular culture, is reconfigured into the structures of everyday kitchen items such as a dishwasher, oven, or, as here, a refrigerator. This work is an important example of how Rosler was able to use Pop art to make strong feminist statements about female objectification by society, which laid the foundation for the important role that she would eventually play in the Feminist art movement. With a jarring visual metaphor, she links the female body, often found in pornographic magazines, to food-related items like pieces of meat, mere commodity for male pleasure and consumption. In addition, the connection of the female body to the domestic realm of the kitchen serves to reinforce the narrow view that was still prevalent in the 1960s of woman as housekeeper, defined only by her role as mother, nurturer, and home provider. In describing this aspect of the series, she stated, "I should think that the reading of 'woman = good mother = food' is apparent in the kitchen set; you might say its theme is 'consumption'." Semiotics of the Kitchen demonstrates Rosler's skill working in the newly developing video art field of the time. It is a black and white video, six minutes and nine seconds in duration. In it, we see the artist walk into a kitchen, don an apron, and proceed to vocally identify kitchen objects in alphabetical order: a for apron, b for bowl, c for chopper, d for dish, etc. As she goes down the roster, she quickly demonstrates each object's use. For the last few letters u through z she simply makes the shape of the letter with broad sweeping gestures of her arms while holding a utensil in each hand. There is a violent force in the manner in which Rosler presents many of the objects, such as slamming down the meat tenderizer or jabbing violently with the ice pick, which contradicts society's image of the happy homemaker in a decidedly passive-aggressive fashion. This work is an important, and seminal, example of early Feminist art and visually asserts the importance of Rosler in this movement. While on one level, it can be viewed as a simple review of household objects, the way that they are presented makes the statement that women were not always happy in their assigned roles as housewife. The viewer is forced to consider that for many women there was a repressive, constraining force, beneath the surface of domestic bliss. In the early 2000s, Rosler returned to her House Beautiful series from the 1960s to further her investigation of war. In this work, Point and Shoot, she continues her use of photomontage. It features a backdrop scene where a tank and troops enter a crowded street in Baghdad, their guns pointed at citizens. One soldier is in a heated confrontation with a woman dressed all in black holding the hand of a small male child while others look on in concern. In sharp contrast at the left forefront of the work, a glamorous bride (or a model for one) is pictured from behind in a long white strapless dress, her blond hair pulled up in a knot. She looks merrily over her shoulder, holding an old-fashioned camera, as she poses coyly for an unseen audience, perhaps gathered around a runway. This new piece in her seminal series was created in response to wars in Afghanistan and Iraq and remains an important example of Rosler's ability to make powerful political statements through her art. Here the frivolousness of society with social concerns such as planning a wedding seem insignificant and ridiculous in comparison to the horrors that are taking place in the Middle East. On another level, there is a strong feminist element to this work and the viewer is asked to consider the stark differences in realities for women in various parts of the world - in particular, the free white American woman versus the repressively veiled Iraqi female. As with the original series, Rosler is asking the viewer to consider the power of the media and advertising to shape what we know of world events. One is asked to question the fact that there are images of bridal gowns filling fashion magazines while parts of the world are at war. For Rosler this hasn't changed much since the time of her first series. In discussing her return to this series after nearly four decades, she stated, "The downside was that people could say, 'She's revisiting something she did 30 years ago.' [...] But I thought that actually was a plus, because I wanted to make the point that with all the differences, this is exactly the same scenario. We haven't advanced at all in the way we go to war."